I am excited to be able to share this column with the readers of Wings magazine and explore the exciting topic of women in aviation. To start this first column off, I would like to introduce Elevate Aviation. Elevate Aviation is a non-profit organization that was founded in Edmonton, Alta. This summer, the organization turns three and what an incredible three years it has been. 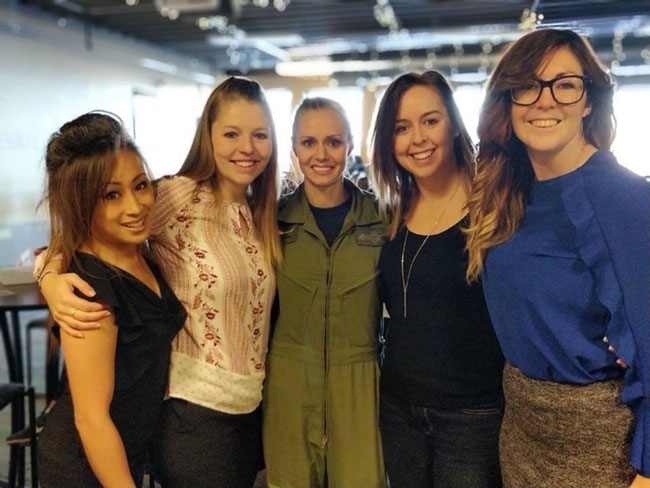 Elevate Aviation can easily be described as having two sides: First, to introduce women to the world of aviation and, second, to support women already in the industry. Elevate Aviation wasn’t started with the intent of growing it into the thriving organization it is today. It was started by the makings of a calendar. Back in 2010, I signed up to make a little trek up Mount Kilimanjaro with a local hospital in Edmonton, the Royal Alexandra Hospital. To join this journey, I had to pay my own way, plus donate $5,000 to the funding of the da Vinci robot at the hospital. Being a single mother at the time, I had no idea how I was going to raise that money. It was because of the help of 11 other air traffic controllers at the Edmonton Area Control Centre, who challenged us to get outside of our comfort zone and be in the calendar, that I was able to raise the funds needed to make the donation. In 2013, my new daughter-in-law joined me and helped create another calendar (for 2014) with funds to go towards a project in El Salvador. While creating that calendar, we noticed that the women involved loved spending time with each other. Some people had never really gotten to know other women in the aviation industry, and the rest, as they say, is history. Today, Elevate Aviation is bringing awareness to women across Canada through our cross-country tours, which are held in early March. These tours started with about 12 young women attending a tour in Edmonton. Now, the tours take place in nine cites across Canada, with a goal of reaching 18 cities next year. Most young women come to our tours not knowing anything about aviation and leave with a newly sparked passion for the industry. We also have speakers who go into schools and organizations to bring the world of aviation directly to them. Once we get the kindle burning for aviation, we fan that fire even further by aligning the potential mentee up with a mentor and bringing them into the workplace for a personal tour. It’s a kind of try-before-you-buy experience. For example, if we find someone interested in air traffic control, we bring her in for a two-hour tour, let her plug in with a real air traffic controller and watch them work for an hour. If she is still interested in the career at that point, we are there for her through the entire process. We have similar programs set up for all areas of aviation, including the military. Want to talk to a woman who has flown a helicopter in the military to see if it’s a career for you? Just let us know! As for the women who are in the industry already, we are looking for more and more speakers to share their careers and people (men or women) who want to be mentors. We are also launching mentorship training in 2018 to help those in the industry gain insights from professionals who can help elevate their careers through interviews with leaders. What’s next for Elevate Aviation? We have a lot of exciting projects in the works that we cannot wait to announce in the near future. While we are getting things ready, we invite you to follow us on Facebook, LinkedIn and Instagram to watch our team compete in Florida at the international Aerospace Maintenance Competition, where we will be sending the first all-female Canadian team. Don’t miss out on our annual calendar launch event on October 20 in Edmonton, Alta. This is our fifth and final calendar launch as we move into a different direction for next year. This launch brings 12 women together from all over Canada and showcases their careers in the industry. The event gives us the funding necessary to keep working throughout the year and we are looking for companies who want to get on board with this amazing movement and support us. For more information please connect with us at info@elevateaviation.ca.